X BLOCKR : An App to Duck ,Drop or Divert Unwanted Calls . Much as I like the convenience of cellphone and freedom it offers to my family and friends to reach me at anytime ,still it won't stop me from asserting that this freedom comes at a price . And there are days when this price seems to be a bit too much . when you are connected ,then everyone from credit card salesperson to automated IVR based advertisements bid for your attention. you always run a risk of getting distracted. In addition to these unsolicited calls there are people whom you know ,but who call you at wrong/ inconvenient hours .While you can afford to ignore the unsolicited calls but ignoring calls from people you know is tricky .you don't want to offend them. All these situation are the reason why there is a plethora of call management application available . Their is a genuine need for such applications but unfortunately in spite of all these offering, the problem is far from solved . Adaptation of all these call management software is very little . I have tried 6 such device based application and 2 Network based call management services but none of them worked for me . from UI to work flow to configuration there were many issue with them. All I was looking for was a simple.easy to use app which do what I mentioned above . XBLOCKR is one such application which is nearest to my idea of good call management application. Developed by Bangalore based Aquilonis Technologies ,X Blockr is an nifty app which help you to handle unwanted calls. its supported for Symbian ,Windows Mobile and BlackBerry Phones.Its a paid application with the price tag of $20 for international users, but it is specially priced at Rs. 349/- for Indian users. You can have a 100 call Trial version for free . This trial version can be downloaded from their website( link). I sideloaded Xblocker to my Nokia E63 . Installation was a smooth two step process . I was ready to use it instantly. X blocker offer you a variety of response for spam calls .With Xblcoker you can choose to DUCK,DROP or DIVERT the call you don't want to answer . When you choose to "Duck" a call ,the caller will hear a default busy message provided by the operator if you are subscribing to voice mail service this will be diverted to your voice mail box. There is also an option to duck with SMS, In that case app will send an automatic message to caller.You can also choose to "DROP" the call , doing this will answer the call for a second and disconnects instantly. This will sound like a network error to the caller .Finally there is an option to divert the call to a number of your choice .All of these three option can either be applied on case-by-case basis or can be configured as a default response to a specific number .Here one of the differentiators or USP of Xblockr is the flexibility it offer to user to choose response on run time . User can choose to duck,drop or divert the call when He/She receive the call or at the end of call.This makes the list management very easy. In addition to that there is a functionality to define "Mode". By defining the mode you allocate a default response to every incoming call. As long as XBLOCKR is set to that mode every call you receive will be answered with the response of your choice. There is also a provision to make a list of special number which can override the mode preference .As an end user I like this kind of granular control over incoming calls. A word of caution : You SHOULD put your Wife's number in that special number's list, whether you put your Boss's number there is entirely up to you :) . I had a brief conversation with Mr.Rahul Rajguru ,CEO of Aquilonis Technologies. He mentioned that customer response to XBlockr has been very encouraging. they have acquired more than 25,000 downloads in less than two months.they are coming up Android support very soon and will be introducing New enhancements in existing applications very soon. I will surely check them out. Do try X Blockr and let me know what you think of it . There are many way in which Mobile Internet is different from PC Internet. but there is one thing in which there is striking similarity in both medium . That is,The sequence in which new user try out application . Like PC,first and foremost use case of Mobile DATA is Email,then its WAP surfing , Once a user get comfortable with Email & WAP he graduate to ? Your guess is as good as mine ,Instant Messaging /Chat . Essentially its the need to have an instant and always-on connectivity which shape our choice of apps. while there are reasonably robust client app available for Email ( Gmail ,RIM BB , NMS) and WAP ( Opera, Skyfire ,Webkit) but there is no such universally accepted benchmark application for Instant Messaging. Mundu Instant messenger can fill this gap .Developed by Mumbai based Geodesic System , Mundu is a paid application . you need to shell out USD $11 for getting one . however you can get a trial version for free by pointing your mobile browser to http://m.mundu.com. Its supported for all leading mobile platform S60, JAVA, WM,Palm,RIM OS and iPhone . Mundu is a nicely designed Mobile IM application which runs on XMPP-Jabber Protocol ,ergo its compatible with all major Instant messengers like YAHOO,GTalk,MSN,AIM,ICQ etc. I installed it on my Nokia E63 and Blackberry . Installation was smooth . I logged in to the application using my G Talk Credential . it shown a list of all my contact . you can segregate contacts by there connectivity status ie you can choose to see only those users which are online at that point of time. if you are logged into multiple IM services than you can also segregate them based on each service . Other regular IM feature like change in status message ,support for background mode,conference across multiple IM services etc are also available . You can also share images and other files with your chat buddies.Customize the color and style of chat text with a range of exciting rich text options and also with a range of emoticons. You can customize sounds, pop-up, vibration preferences for all IM alerts. It can send e-mail notifications whenever you receive new mail in your Gmail, MSN, or Yahoo! accounts. It supports some European languages, too, so you don't have to chat exclusively in English. The best thing about Mundu is its Excellent User interface . For such a feature rich application Mundu has got an extremely clean and intuitive UI & work flow .This kind of simplicity is hard to achieve in mobile applications. There are some minor deference in terms of swiftness and experience across various platform but that's more of the problem of underlying OS than application itself. Getting PC like IM experience replicated on resource constrained environment of a mobile phone is a tough task , but Mundu has demonstrated that it can be done with right kind of UI and under the hood optimization . 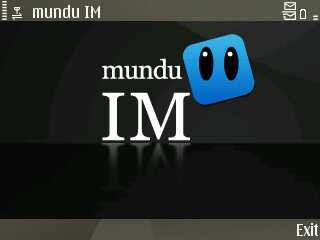 Big Kudos to Geodesic team for this .Do try out Mundu IM . I am sure you will end up buying full version . Trust me its USD $ 11 well spent . Fact that masses in India has embraced Mobile phone in a spectacular manner is an old news. We are the fastest growing telecom market in world. Its only logical to extrapolate that this huge user base represent a huge untapped potential for content consumption and creation. However this content revolution hasn't really happened in India yet . There are many roadblocks . there are some unresolved issues with device .Things like keypad layout is not optimized for indic language input ,inability to support rendering of Indic language content on majority of devices etc .Most devices today are inherently incapable to render Indic language content on their screens. There are many companies who are trying to crack this market by creating applications which enable Indic content on Mobile phones. 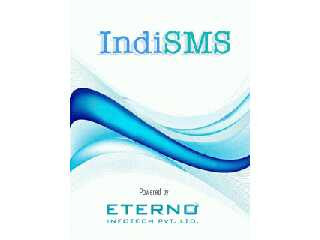 IndiSMS from Eterno Infotech is one such application. 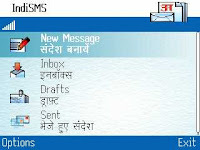 It allow user to create SMS in Indian languages . IndiSMS is a mobile application that helps people send & received SMSs in Indian languages. Anyone can download the application and use.you can download the application from website (link) or get it from Ovi store (link) .It is supported for all S60 devices and all major Samsung ,Sony Ericssion and Motorola devices . you can get the list of supported devices here. Its a free application .There are no charges for downloading or using IndiSMS application. only one standard SMS charge to get activation code.App size is of 389KB .I downloaded it on my Nokia E63 . It was a smooth installation with only couple of intermediate steps.after installation you are ready to send and receive text messages in 9 Indian language. Hindi, Marathi, Punjabi, Gujarati, Bengali, Telugu, Kannada, Malayalam, Tamil. IndiSMS uses Transliteration method for accepting input on Mobile phones. this essentially means that you need not to modify the keyboard layout of device or learn new technique of keying in the input. all you need to do is to simply enter phonetic equivalent of word and IndiSMS will display it into your prefered language. Thanks to our habit of sending messages in hinglish, the learning curve for user to master transliteration is very little . Most user can pick it up on the fly. There is no extra price you need to pay for sending SMS using IndiSMS , Each message sent using IndiSMS will cost you the standard charges that you pay your mobile operator for short messages.however because out going message is sent in unicode so there is a restriction on Maximum number of character which can be sent per SMS.It can send only 70 characters in an Indian language message versus 160 characters in English. if you continue typing beyond the limit of 70 characters ,the extra characters will get split into a second message automatically.Since its a Unicode based application ,ergo on recieving end, messages are displayed properly on all those phones which are unicode compliant . 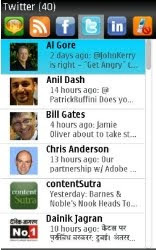 Sometime back I have reviewed another application by Eterno Infortech . Its called NewsHunt.What I like about IndiSMS and other product from Eterno is their approach toward solving the problem of Indic content in India. IndiSMS is a part of suit of Indic language products developed by Eterno.IndiSMS do an excellent job of providing user first glimpse of Indic Language capability of mobile devices. Thanks to the popularity of SMS in India we couldn't have asked for a better use case. This can be a steeping stone for user to adopt various other usage like reading news , browsing music catalog in Indic Languages etc . This step by step approach of exposing user to Indic language content can do a wonderful job of seeding user interest in this field . Do try this out yourself and surprise your friends by sending a SMS in your native language . First and foremost use case of Cellphone is still for making voice calls. But if I have to make a guess about which is the most frequently used cellphone feature after voice . I am sure that it will be SMS and Calculator . Part of their appeal is in their ubiquity across devices . Almost every cellphone in market have an SMS and calculator functionality . While SMS captures attention of everybody from handset OEM to Network operators ,calculator is treated like a step child . There hasn't been much innovation in Calender application . 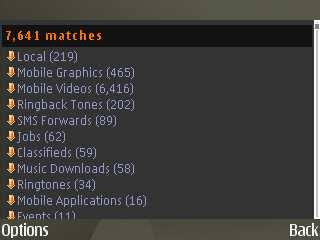 Both in terms of UI and functionality . UI is very cumbersome and not easy to use . As anyone who has tried to use his cellphone calculator to tally a grocery bill , split bill at a dutch party or need to do a quick currency conversion will testify.Most of the time we use it because there is no other alternate app available to do the same . 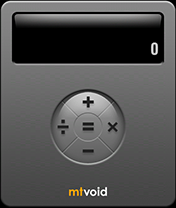 So I was very happy to discover Calcium ,a Calculator app by Mtvoid . Its not a Full blown Casio style 100-Function scientific calculator but a strip down ,bare basic , easy to use, 4 function calculator which can serve requirement of 90% of the users. Calcium is a nifty app of just 90KB in size . you can download it for free from Mtvoid website . Calcium is supported for S60 devices . I installed it on my Nokia E63 and process was smooth.After just three clicks during installation.I was ready to use the app .The elegance of UI design in Calcium is outstanding . They have essentially mapped all the operation of calculator to joystick and in doing so removed the need to select on-screen buttons and moved all the operations to the joystick. Left arrow key is mapped to divide ,RIGHT arrow key is mapped to multiplication, UP arrow key is mapped to addition and DOWN arrow key is mapped to subtraction. Select button in the center of joystick is mapped to equivalence /result ( "=". ) operation. you can use numeric keys of your device for entering data and # key is used for inserting decimal point. Thanks to the onscreen display interface much of this mapping can be intuitively grasped by end user . it took me less than a minute to figure it out. After initial learning curve you are ready to fly with it . USP of Calcium is that With calcium,number of key press required to perform a certain calculation is significantly reduced. for example start the standard calculator and do 2/3 x 7. It takes 13 clicks. Using Calcium it only takes 6. Now that's a productivity Value add . Its refreshing to see innovation in a seemingly dead evolved category of Mobile app .its a testimony that there is always room for improvement. Do give it a shot and let me know how you feel about it.